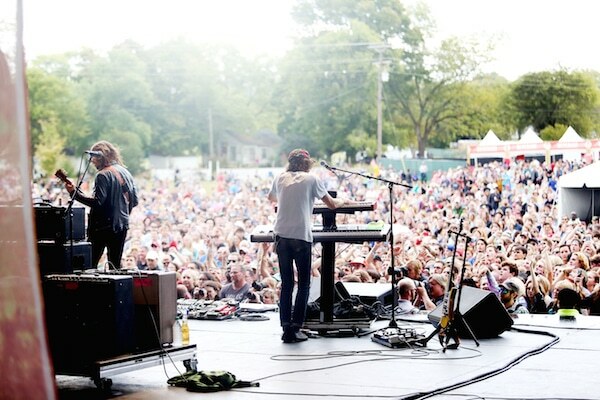 Cage the Elephant perform at Pilgrimage Festival on Saturday. Photo by Steve Wrubel. Overcast skies and eventually, a downpour, may have kept first-day attendance at the inaugural Pilgrimage Music & Cultural Festival well below its planners’ goal of 15,000. But those who came to the Park at Harlinsdale in Franklin, Tenn., about a half-hour outside of Nashville, were treated to laid-back, hassle-free festival vibe and a great day of music from a variety of top-notch acts — from opener Stevie Woodward’s 10:30 a.m. set to Wilco’s headlining slot at 6:15 p.m. The 250-acre former horse farm was filled with two large stages — labeled Midnight Sun and Gold Record Road (after the Americana Music Triangle) — and a slightly smaller third stage, Harpeth River, along with a Little Pilgrims kids stage and a pickin’ parlor stage with an unadvertised roster. The mainstages resounded with sets by an intriguing mix of artists: Weezer, Sheryl Crow, Cage the Elephant, Iron & Wine, Neko Case, Trampled by Turtles, Saint Motel, Holly Williams, Elel and teenage blues phenom Christone “Kingfish” Ingram. Headlining the third stage, New Orleans’ resident piano funkster Dr. John actually played guitar; the scarily talented Punch Brothers deconstructed bluegrass; hometown singer-songwriter Will Hoge generated some post-set buzz among new fans; and Madison Ward & the Mama Bear charmed with their upbeat folk harmonies. In addition to filling the park with her powerful voice during her own early set, Williams later joined her friend Crow on “Strong Enough.” The latter stuck to hits and familiar tunes, including her cover of Yusef Islam’s “The First Cut is the Deepest” (written when he was known as Cat Stevens). Before she played it, she exhorted the audience to go buy records by the artists playing the festival. And indeed it is, with a layout designed for easy access to stages, vendors, sponsor tables and similar areas. Chocolatiers and other unusual food and product vendors offered samples, a former stable area was covered in art for sale and nonprofit organizations promoted their causes in areas that were neither obscure or over-crowded. Lines formed for beverages and popular food vendors, but they seemed to move rapidly. A little too much area was devoted to VIP and sponsor areas, but festivals do make their money that way. Ideally. If all goes as promoters hope, this one will earn its way to another year — and many more after. Sunday’s lineup features an even more eclectic roster, including Band of Horses, Dawes, Nikki Lane, Jimmy Cliff, The Lone Bellow, Chris Stapleton, St. Paul & the Broken Bones, Steven Tyler and, to close it out properly, Mr. Willie Nelson.